Bob Arnold (as Steve Hackett) with his Les Paul Gold Top as his main instrument is a hard-core devotee of Steve Hackett’s work (including both electric and acoustic repertoires) – marvelling at his jaw-dropping rendition of the Firth of Fifth solo is one of many highlights! Phildas Bhakta ‘The Orange Turbaned Drummer’ (also as Phil Collins and features in our double drumming sequeces) is our highly accomplished Swiss percussionist. Inspired by Phil Collins, from when she first started playing drums, she is a stickler for reproducing his work accurately, and her fans love it! 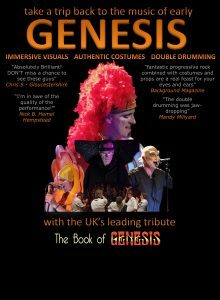 2018 has been a successful year seeing the band touring both in the UK (including Charterhouse School – where Genesis formed) and in Europe (Park Villa Theatre, Alphen aan den Rijn, Rotterdam, The Netherlands).